Welcome to our calendar app! ক্যালেন্ডার অ্যাপ এ আপনাদেরকে সুস্বাগতম! Bangla calander 2018 / bangla calendar 1425 is contained in this calendar application along with Arabic calendar/ Islamic calendar 2018, keeping in mind your need for a hijri calendar in Arabic and English 2018. You can call it as calendar ‘en bn ar 2018’, if you want. This will work as a holiday calendar for you as it features the official holiday calendar 2018 of Bangladesh. You can find all the government holidays such as pohela boishakh, eid, puja - etc, in this helpful bangla calendar app. If you have typed in the search box with something like, ‘kon din ki dibosh 2018’, ‘kon din kon dibos 2018’, ‘bangla celender 2018’ - this is exactly what you want, be assured. 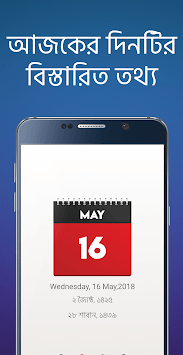 You can find all you want regarding your need for a perfect bangla calendar app, which also includes English and Arabic/ hijri calendar 2018. This one app will help you go through the whole year without letting you wasting your time looking through internet, paper calendar and other means of finding out the holidays of the year. So, to stay comfortable with all the information of holidays in 2018 in your hand, just download and install this app and enjoy your life without having to sweat your head throughout the year. Happy holidays. 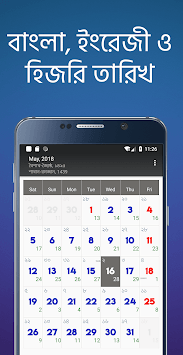 Bengali calendar is a complete solution for your daily life. Kelendar is one of the most significant part of our daily life. This bangla calendar comes with all special days (Kon din ki dibosh), all govt holidays even with the event reminder. Moreover this Ponjika is for every year . So you don’t need to download kelendar for every year separately. Once you have this app you get everything at once like all chutir talika Kon din kon day. Hope this holiday calendar will serve you the most . Download for free and enjoy!